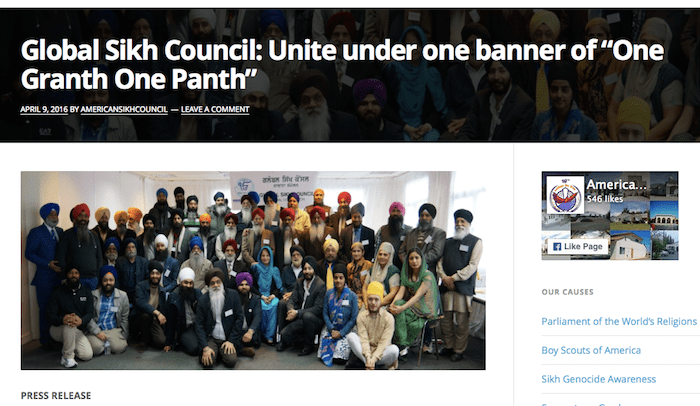 A Sikh council claiming representatives from 20 countries, including Malaysia, has called on Sikh organisations to unite under the banner of ‘One Granth One Panth’, promote the teachings of the Guru Granth Sahib, take guidance from the 1945 Rehat Maryada and accept the 1999-version of the Nanakshahi calendar. These were among the six resolutions by the the so-called Global Sikh Council (GSC) which held its annual general meeting in Paris, France, from March 18 to 20th. It was attended by representatives from 20 countries, it said in a statement dated 6 April. American Sikh Council (ASC) chairperson Gulbarg Singh is listed as the GSC president. Other key office bearers are Lady Kanwaljit Kaur Singh (UK) as its vice president, Davinder Singh Eari (Kenya) as secretary and Dalbir Singh (Italy) as the treasurer. The representative form Malaysia was Harcharan Singh, a former jathedar of Sikh Naujawan Sabha Malaysia (SNSM) and also president of the Malaysian Gurdwaras Council (MGC). He was also a former president of the Malaysian Consultative Council of Buddhism, Christianity, Hinduism, Sikhism and Taoism (MCCBCHST). The GSC statement said Sikh organisations from five additional countries joined the council to adopt six new projects for the coming year, including developing a training program to ensure Sikh pracharaks are bi-lingual and proficient in the language of the country in which they preach, in addition to their understanding of Gurbani. The other projects include developing Gurmukhi learning text books in line with local and national environments and facilitating inclusion of Gurmukhi language and Sikh Philosophy courses in high school and university curricula all around the world. It also has extended its office to facilitate the setting up of a Sikh University in Kenya. 1. Putting all differences aside, individuals and organizations (political or otherwise) are requested to unite under one banner of One Granth One Panth. 2. GSC supports all individuals and organizations who promote the teachings of the Guru Granth Sahib and the guidance of the 1945 Rehat Maryada and no other Granth or Scripture. 3. GSC condemns the sacrilegious actions of those responsible for the desecration of Sri Guru Granth Sahib and supports and applauds all those working to bring the perpetrators to justice on the issue. 4. All individuals and organizations working with a non-Sikh supporting Organization and its affiliates, against the interest of the Sikhs, should be publicly exposed and boycotted. 5. GSC voices its concern over some of the recent politically inspired edicts from the Akal Takhat. The GSC believes that the politically appointed office bearers have no right to issue such edicts. 6. GSC strongly recommends to the Sikh Community worldwide, the acceptance and use of the Nanakshahi calendar (1999 version) as originally accepted by the SGPC as well. The Sikh nation stands at a very dangerous crossroads. The need of the hour is to unite under the Guru Granth Sahib stated Principle of ONE – Ek Oangkar, Ek GurBani, Ek Granth, Ek Panth Ek Maryada. This is a very bold and commendable step towards promoting active Unity in the Guru Khalsa Panth by the GSC. The thousands of cult deras, the hundreds of various maryadas, and rituals etc are creating a very serious division in the Sikhs and the time has come to put a stop to this. Missionary Parcharaks like Darshan Singh ragi ex Jathedar Akal takhat Sahib, Sarabjit Singh Dhunda, and many others are making serious and deep inroads by spreading the Sacred Principle of Eko Guru Eko Gurbani Eko Vichar and hitting at the very roots of the dehdharee cults of saints, human gurus, mahapurash etc etc because these are diverting the Sikh away from the GURU and towards the dehdharee cultist deras. These deras have parkash of SGGS simply as adiversionary tactic to attract the gullible sikhs and mislead them into thinking they are being joined to the SGGS when in fact they are being made into DERAWADEE Sikhs who swear by their dera Baba ji more than the SGGS as Shabad Guru. This is a dangeorus trend which needs to be checked forthwith before the Sikh Panth can get back on the SGGS path. I agree strongly with the Nanakshai calednar 1999 approved and sanctioned by both the General house of the SGPC and the Akal takhat. This National calendar unifies the Sikhs as well as giving us a Separate National Image which frees us form the clutches of the unknowns who change the dates of our Gurpurabs each year and who hold the Sikh nation to ransom each year as we await the jantrees that will tell us when to celebrate our most vital and important Gurpurabs.The Independent and fixed Nanakshai calendar lets us fix our own dates as an Independent Kaum and Religion. Sikh Gurdwars the world over should lend their full support to this effort at unification. let us not miss the boat.